In a rapidly changing world the jobs that make up our economy are transforming as fast as the products we use. The majority of children born today will one day pursue careers that do not even exist yet, and many jobs in advanced economies are at risk of being automated within the next 20 years. Digital innovations have completely changed the working environment as we know it. Keeping up with the effects of this digital transformation on the workforce is a priority for CEOs and HR professionals. However, few companies are well equipped to thrive in this new work climate where everything is driven by technology. This paper takes a look at how digital transformation affects workforce needs and examines how employers can create a workforce that is not only digital-ready but that has the skills needed to adapt to changing technologies and industry needs in the future. 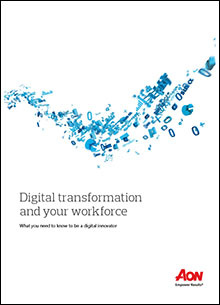 Download the free whitepaper now to discover if your workforce is digital-ready and what you need to do to be a digital innovator.